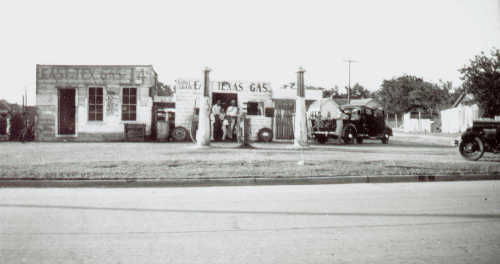 Looney Brothers, East Texas Gas, Marlin, Texas, 1947. 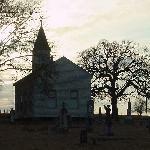 The station was owned and operated by my two Uncles (brothers) Fountain Asbury Looney and John Dennis "J.D." Looney. Fountain is the man in the cowboy hat, white shirt and tie. His younger brother "J.D." is shown putting water into the cars radiator. 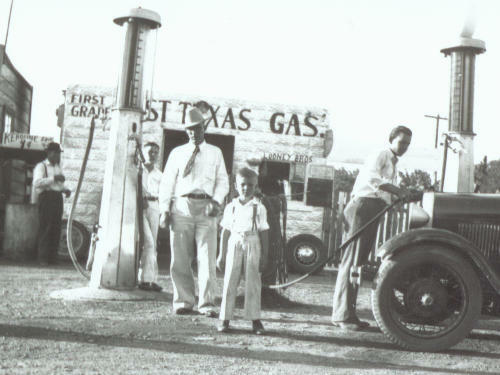 The boy standing in front is Fountain's younger son, Roy Looney and the boy standing by the gas pump is Fountain's older son, Ray Looney. At the time these photos were taken the family lived in the small one room building which is on the left side of the photo. 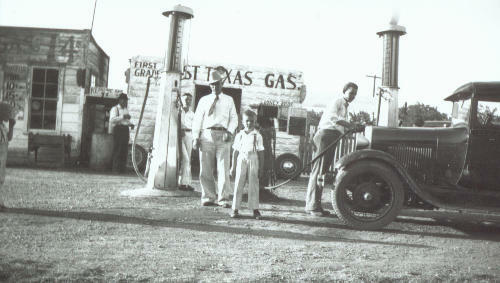 When is the last time you saw gas selling for 14 cents and Kerosene for 9 cents? My cousin Ray Looney told me one time at this station he really got a good whoopin. 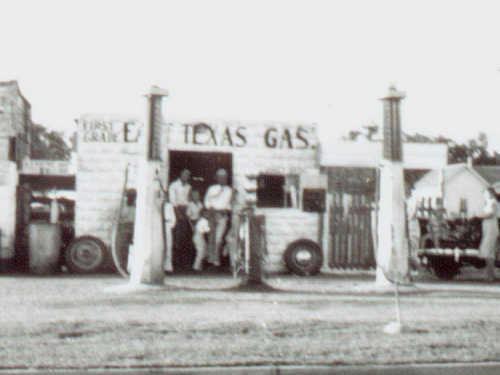 Gas was measured by being pumped up into the metered glass enclosure on the top of the gas pump. While his daddy was releasing a measured amount of gas into a customer's car, Ray thought he would be helpful by continuing to pump gas into the glass enclosure. Needless to say his daddy was not too pleased once he saw his hard earned gas money being given away like that. These photos I know was taken by someone in my family as I am in possession of the original negative which was handed down to me by my mother, Eula Bea (Looney) Johnson.